Andre Rozier: Khurtsidze Will 'Beat Down' Billy Joe Saunders! Andre Rozier, trainer of newly-crowned WBO Interim World Middleweight Champion Avtandil Khurtsidze, believes his man will ‘beat down’ undefeated Hatfield star Billy Joe Saunders when the pair face-off for the full WBO crown. 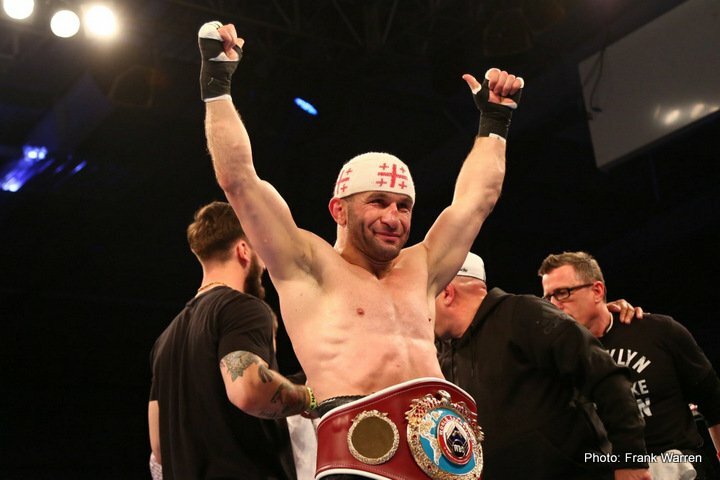 Khurtsidze – a short, stocky beast of a boxer – silenced the Leicester Arena crowd on Saturday by heavily flooring Birmingham’s Tommy Langford with a brutal left hand early in the fifth round to secure the vacant Interim strap. Saunders and Khurtsidze had to be separated at a heated post fight press conference in Leicester and it looks like the war of words will continue until they settle their differences in the ring. Birmingham’s Tommy Langford was beaten by Avtandil Khurtsidze with a fifth-round stoppage as the Brooklyn-based Georgian claimed the Interim WBO Middleweight belt to set up an intriguing bout against undefeated WBO World Champion Billy Joe Saunders. Khurtsidze came out swinging, putting Langford under relentless pressure from the off. He caught Langford a couple of times with his vicious left hand and barely took a step back during the opening rounds. British Champion Langford was drawn in to a slugfest at times, unable to keep the 5′ 4″ ‘mini Mike Tyson’ at bay. It was a huge left hand from Khurtsidze that finished the fight, Langford dropped his hands and was unable to avoid the shot. Saunders was unimpressed with Khurtsidze’s win, stating: “No disrespect to him but I will show you what he is when I fight him. All he is to me is a puffed up Danny De Vito coming forward throwing punches. A slugfest; a Fight of the Year contender; and huge knockouts – bringing boxing back to Leicester delivered! Catch up with the results from the Leicester Arena below. Ricky Hatton’s Super-Middleweight charge Chris Blaney opened the evening’s action with a hard-fought points win over Plymouth’s Christian Hoskin Gomez. The ‘Ginja Ninja’ from Navan, Ireland was made to work for his win, with Gomez pushing him throughout. Former WBO European Lightweight Champion Tom Stalker made a winning return against Chris Adaway. Stalker, 32, put the disappointment of losing his European title to Craig Evans behind him with a comfortable 60-55 decision over Plymouth’s Adaway. Birmingham’s Raza Hamza improved his unbeaten record to 8-0-1 with a gutsy win over tough South American journeyman Rafael Castillo. Hamza, 24, put Castillo down in the first round but was unable to force the stoppage, despite landing some impressive combos. Commonwealth Bronze Medallist Sam Maxwell moved to 2-0 with his first professional TKO win over Loughton’s Georgie Wright. Maxwell, trained by legendary Liverpool coach George Vaughan, produced an eye-catching performance, making Wright miss throughout. The stoppage came 55 seconds into the fifth round. Nottingham Welterweight talent Ekow Essuman moved to 3-0 with an explosive stoppage win over Northern Ireland’s Casey Blair. Essuman, trained by Barrington Brown, was too strong for Blair, forcing the stoppage 26 seconds into the third. Slick South African Zolani Tete picked up the Vacant Interim WBO World Bantamweight crown after outclassing Arthur Villanueva at the Leicester Arena, live on BoxNation. Tete (25-3, 20 KO’s) was well on top for the majority of the fight as Villanueva struggled to deal with his impressive timing and speed. ‘Last Born’, a former IBF Super-Flyweight Champion, landed several punishing shots on the Philippine and dropped him in the eleventh round. ‘Ferocious’ Darryll Williams and Jahmaine ‘Smasher’ Smyle fought a tremendous battle for the English Super-Middleweight title, with many describing the all-out war as an early contender for Fight of the Year. Williams travelled to Leicester to take Smyle on in his own back yard and dragged him into a thrilling confrontation, seizing the belt on a split decision. There was no love lost in the build up to their eagerly-anticipated clash, and the fight certainly didn’t fail to deliver. South London’s Williams moves to 15-0 with a career best win. Ilford’s Light-Heavyweight ‘Beast’ Anthony Yarde finished Sheffield’s Darren Snow with a sickening body shot in the opening round. Yarde unloaded a punishing combination and a brutal right hand body shot to drop Snow heavily to the canvas. It was the sixth first-round knockout win of his 10-0. 9 KO’s career. Next up for Yarde is a shot at the Southern Arena title against Chris Hobbs at the Copper Box Arena on Saturday 20th May. Dynamite Daniel Dubois blasted out former Olympian and Commonwealth Games Bronze Medallist Blaise Mendouo (3-2) in the second round of his second professional fight. Early in the second round a huge right cross and heavy left hook dropped Mendouo in the ropes to earn 19-year-old Dubois another impressive knockout win. Huddersfields Tyrone Nurse retained his British Super-Lightweight title after tough Malmesbury man Joe Hughes held him to a majority draw. The contest continued to ebb and flow between the two contrasting styles in the closing rounds. After the fight, both fighters expressed a desire to settle the draw with a rematch. Exciting Leicester Super-Featherweight talent Lyon Woodstock forced an impressive third round TKO over Birmingham’s Paul Holt to pick up the Vacant Midlands Area strap – his first professional Title. Holt came out all guns blazing and appeared to have Woodstock in trouble during the first round, attempting to bully him into submission. Woodstock steamed into Holt in the third, forcing Holt to cover up and protect himself from a punishing barrage of well-timed combos. The Leicester man got his stoppage win 2:45 into the third round, finishing the fight with a big left hand followed by a brutal right before the referee jumped in. Birmingham’s Tommy Langford was beaten by Avtandil Khurtsidze with a fifth-round stoppage as the Brooklyn-based Georgian set up a bout against WBO World Champion Billy Joe Saunders. The stoppage came 27 seconds into the fifth round. Unbeaten WBO boss Saunders was unimpressed with Khurtsidze’s win, stating: “No disrespect to him but I will show you what he is when I fight him. All he is to me is a puffed up Danny De Vito coming forward throwing punches. Maerdy Middleweight Alex Hughes took his unbeaten record into double figures with an impressive first round demolition of Poland’s Daniel Urbanski. In the final fight of the evening, Leicester Super-Welterweight CJ Challenger moved to 3-0 with a first-round TKO of Driffield’s Danny Little. Next boxing news: Tickets to Michael Conlan’s Chicago Fight Go On Sale! You are here: Home / Boxing News / Andre Rozier: Khurtsidze Will ‘Beat Down’ Billy Joe Saunders!